This stitch pattern uses multiples of 6 + 2, this means that to make your scarf wider make your chain in multiples of 6 ie. 6, 12, 18, 24, 30, 36 etc. You only add the +2 once. My scarf uses a chain of 36 + 2 for a total of 38 chains. Row 1 - (wrong side): CL in 5th ch from hook; *sk next 2 chs, V-st in next ch, sk next 2 chs, CL shell in next ch; rep from * across to last 3 chs, 2 dc in last ch; ch 5, turn. Row 2 - CL in first dc, *V-st in ch 2 sp of next shell, CL shell in ch 1 sp on next V-st; rep from * across ending with skip last cluster and ch of turning ch, work 2 dc in next ch; ch 5, turn. Row 3 - CL in first dc, *V-st in ch 2 sp of next shell, CL shell in ch 1 sp of next V-st; rep from * ending with 2 dc in 3rd ch of turning ch; ch 5 turn. Row 4 - CL in first dc, *V-st in ch 2 sp on next shell; CL shell ch 1 sp of next V-st; rep from * across, ending last repeat with 2 dc in 3rd ch of turning ch 5; ch 5 turn. Repeat Rows 3 & 4 for pattern ending by working Row 4. 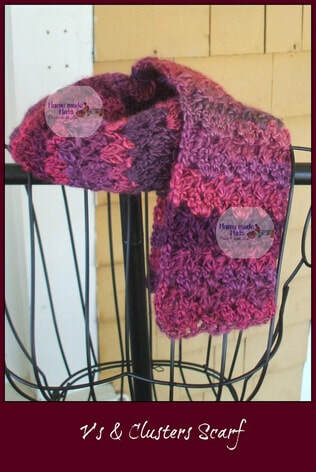 This Scarf measures 8.5 x 34 inches using 1 3.5 oz skein of Unforgettable by Red Heart Yarns. This pattern is © of Home made hats by Cheryl. You may make this pattern to sell, for charity or for personal use. You may not reproduce this pattern in any written or digital form. You may not use my photos to promote your own work. If you wish to share this pattern, please use the handy share buttons to the left to share the link with your friends. Please see my Terms and Conditions for more information.